If you are concerned that your upper arms are sagging or beginning to show signs of aging, Dr. Stephen P. Hardy can perform a personalized brachioplasty, also known as an arm lift, at his Missoula, MT, practice. Brachioplasty removes loose skin and re-sculpts tissue for a more youthful, firm, and attractive upper arm area. 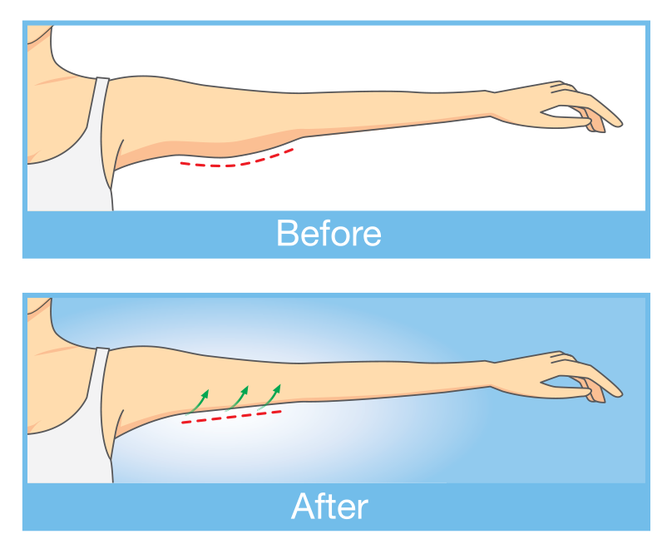 Depending on the type of arm lift selected, your incisions could run from the underarm to above the elbow. In some cases, liposuction may also be performed to remove excess fat. Do I Qualify for Brachioplasty? Surgical Preparation: It is important that you follow Dr. Hardy’s surgery preparation instructions carefully. They will include refraining from smoking for at least four weeks and avoiding certain medications. Anesthesia: Immediately before your procedure, Dr. Hardy will administer anesthesia to ensure your comfort during surgery. Making the Incisions: Your incision lengths will depend on the type of arm lift procedure chosen. If you have a lot of excess skin, Dr. Hardy will make an incision near the elbow along the inside of the arm, up to the underarm. If you have excess tissue, Dr. Hardy may also perform liposuction. Once the incisions have been made, he will tighten and reshape the tissue and skin around the muscle. He will then carefully remove excess skin, making sure your scars are as discreet as possible. Closing the Incisions: Once the excess fat or skin has been removed, Dr. Hardy will carefully close the incisions with sutures and bandages. Your sutures can usually be removed one to two weeks after surgery. Recovery and Results: Although an arm lift is considered an outpatient surgery, you will need to have someone drive you home and stay with you for the first couple of nights. You may experience some pain, bruising, and swelling for the first few weeks, but you will notice firmer arms almost immediately. Although there are many benefits to undergoing cosmetic surgery of any kind, there are risks involved as well. These can include infection, excessive bleeding, scarring, or unsatisfactory results. During your initial consultation with Dr. Hardy, he will review these risks with you, so that you are fully informed. A lifestyle that promotes good overall health, including proper nutrition and exercise, is crucial in maintaining optimal results. It is also important that you view your procedure as one step in a journey toward a whole new healthy lifestyle. A lifestyle that promotes good overall health, including proper nutrition and exercise, is crucial in maintaining optimal results. An arm lift at Northwest Plastic Surgery Associates can result in a smoother and more toned look of the upper arm area. To learn more about brachioplasty, contact us today and schedule your consultation.